Edelbrock Corporation has six locations: Three in Torrance California, two in San Jacinto, California, and one in Sanford North Carolina totaling over 500,000 square feet. 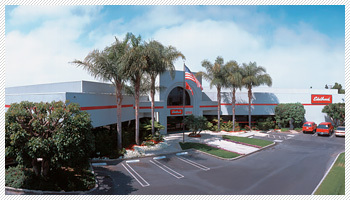 Torrance Headquarters include: R&D; manufacturing; state-of-the-art testing facilities, advertising and tech support. Less than a mile away is Russell Plumbing and our Distribution Center. Our Aluminum Foundries are located close by in San Jacinto. In 2008 we added a new Permanent Mold and Heat Treat facility next to our existing sand cast foundry, which has been called "the most state-of-the-art sand cast foundry west of the Mississippi." This investment in American facilities is part of our commitment to "Made in USA" products and performance. Vic Sr. left behind a great team of very talented people. Bobby Meeks, Don Towle and Robert Bradford were on hand to assist Vic Jr. in continuing his father's dream. In 1964, a good friend named Bob Joehnck saw an opportunity to develop an intake for a small-block Chevy. Vic's response was, "No, the factory already makes a manifold." He changed his mind a week later. The C-4B manifold was another turning point for the Edelbrock Equipment Company. The "golden age of the 1960s and 1970s" brought about the Tunnel Ram, Tarantula and Streetmaster manifolds. Vic Jr. was looking towards the future of the industry. From 1971 to 1974, he served as President of the Specialty Equipment Marketing Association (SEMA) to educate both the public and the legislators in Washington to the benefits of a strong and legal performance parts industry.The '80s and '90s brought about a new direction as Edelbrock Corporation moved into a more diverse product line with carburetors, camshaft kits, valvetrain parts, exhaust systems, engine accessories, fuel system parts, cylinder heads and more. At the early age of 49, cancer took the life of Vic Edelbrock Sr. He was a man held in high esteem and it was a sad day for the aftermarket industry and for those who loved him. 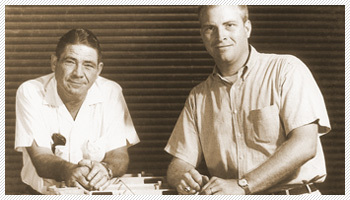 The year was 1962 and the Edelbrock Equipment Company was handed over to Vic Jr. and a group of loyal employees, most of whom had been with Vic Sr. since the beginning. They knew what it took to continue the traditions Vic Sr. had begun. 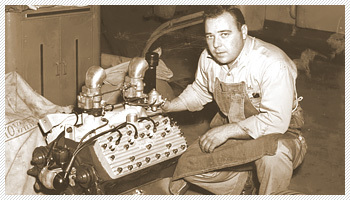 Vic Sr. began dyno tests on the brand new small-block Chevrolet engine in 1955. Several power-producing manifolds were the result, the first being the three-carb intake manifold that was featured on the cover of Hot Rod magazine. The six-carb Ram Log manifold for the street and strip was the next development. Then in 1958, Vic managed an industry first by getting one horsepower-per-cubic-inch from a 283 cid small-block Chevy with the new Cross Ram manifold. 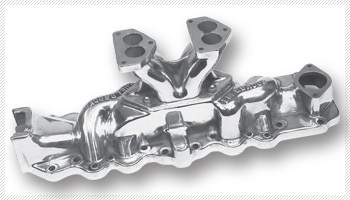 This breakthrough led Edelbrock to develop manifolds for Pontiac and Chrysler engines as well. 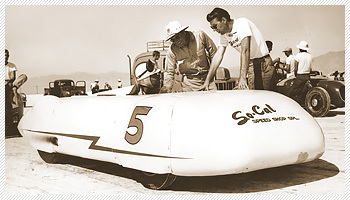 In the early 1950's, dry lakes racing activities expanded to include Bonneville. Edelbrock-equipped cars continued to dominate. The first single engine streamliner to go over 200 mph was the Edelbrock-equipped Bachelor-Xydias So. Cal. Special. Don Waite, former Vice President of Engineering at Edelbrock from 1990-95, raced an Edelbrock-equipped 160 mph 1927 Model-T Roadster. When Don decided his Roadster needed to go faster, he worked with Vic Sr. and Bobby Meeks from 1950 to 1952 to streamline the body and build a 304 cubic-inch flathead. Now called "The Edelbrock Special" the roadster was equipped with an Edelbrock 4-carb intake, Edelbrock heads and pistons. Using nitromethane, this 1927 Model-T went 192 mph on the Bonneville Salt Flats. During this time, the business continued to expand. 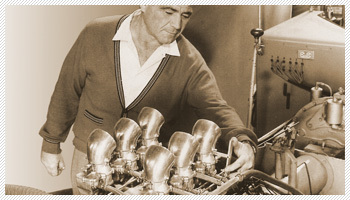 The Edelbrock catalog grew as Vic expanded his line of cylinder heads, intake manifolds, flywheels, pistons, cams and adjustable tappets for Fords, Mercurys and Lincolns. His catalog also included parts from Paul Scheifer, Ed Iskenderian, Harmon & Collins and Ed Winfield. 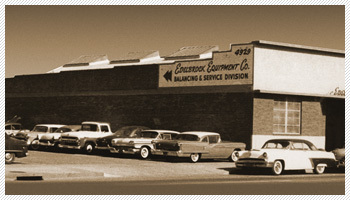 Business flourished and in 1949, Vic moved into his first purpose-built shop on Jefferson Blvd. It was 5,000 sq. ft. and equipped with a small machine shop, repair bays, engine dynamometer, a small stock room and office space. In this new facility, Vic expanded his business by designing more cylinder heads, more intake manifolds and even racing pistons for several different applications. With a solid business now developing, Vic bought one of the performance industry's first engine dynos in 1948. With this 200 HP Clayton dyno he was now able to get actual data to gauge the effectiveness of his products. This dyno allowed Vic to prove that his designs not only won races but made measurable performance gains. By now, Vic Edelbrock Sr.'s equipment was on almost every winning car on the dry lakes and the midget tracks. Before the war, Vic bought his first midget and knew it wouldn't be his last. In 1946, he bought a midget built by D.W. McCully. But it was the third midget he purchased that would become part of racing history. The 7th Kurtis Kraft midget, which the company still owns, was purchased later that year. With Bobby Meeks as head wrench, they toured the Southern California tracks, racing up to six nights a week. Vic's winning team included such greats as Perry Grimm, Walt Faulkner, Billy Vukovich and Rodger Ward. 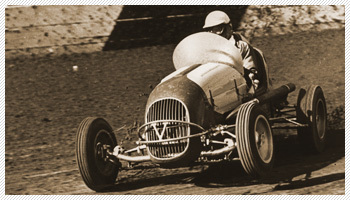 Vic was now known for fast flathead Fords and race-winning midgets. History was made when Vic's V8-60 equipped midget broke the winning streak of the Offy-equipped midgets. With Rodger Ward at the wheel and nitromethane in the fuel, #27 beat the Offys in the first and only V8-60 win at the famous Gilmore Stadium.Vic was the first to use nitromethane as fuel, and needless to say, his competitors had no idea what that strange smell and color was coming from the exhaust. At the end of the war, he purchased his first building to open a machine shop and repair facility at 1200 North Highland in Hollywood, CA. It was here that Vic designed his first aluminum racing heads for Flathead Fords. Like the Slingshot, these heads were well received. The business was on the way to becoming more of a performance parts shop than a repair shop. So much so, that the idea was set forth to create a catalog offering parts for general sale. 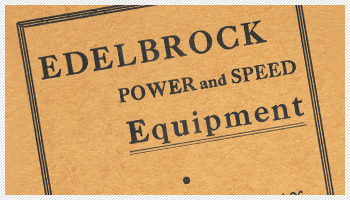 The first catalog was printed in 1946 with the name "Edelbrock Power and Speed Equipment" across the front cover. This catalog included Edelbrock heads and intakes as well as pistons, steering wheels and crankshafts. At this time, Vic was committed to running his business and participating in his favorite sport... midget racing. The roadster became an important part of Vic' s product development. He would install his parts on the roadster to determine how well they would perform. 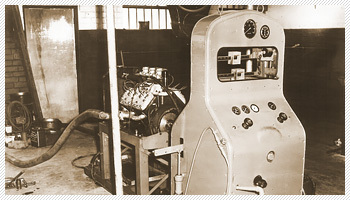 One of Vic's ideas was modified factory cast iron "Denver" cylinder heads which incorporated a special high-altitude design featuring higher compression. Vic would fill and mill the head for a further increase in the compression, gaining even more power. Meanwhile, Vic received multiple requests for his twin carb manifold. This was the driving force behind the opening of his own performance parts business. 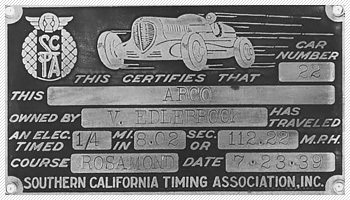 Three weeks before Pearl Harbor and the start of World War II, Vic was clocked at the speed of 121.42 mph in his '32 at Rosamond Dry Lake. During the war, Vic shelved his racing activities and used his machinist skills for the war effort. Vic's war-time experiences increased his perception of what he could build with the right machining tools. When Vic bought the roadster, he joined with Tommy Thickstun to design the "Thickstun" manifold for the Flathead. When Vic wasn't happy with the performance, he designed his own aluminum intake manifold. It was called the "Slingshot". The Slingshot was a 180° manifold for a Ford flathead using two Stromberg 97 carburetors. This was the first product to feature the famous "EDELBROCK" name. Before the war, Vic produced about 100 of these Flathead Ford manifolds. Vic raced and tested his new manifold on his 1932 Ford at Muroc Dry Lake, 80 miles northeast of Los Angeles (where Edwards Air Force base is today). Vic became a consistent winner with his modified roadster at racing speeds of 112 mph. Vic would drive the Ford to the dry lakes, remove the fenders and the windshield, then race the car. At the end of the races, he would re-install the fenders and the windshield and drive it home. In 1931, Vic migrated to California to live with his brother. It was here that he met Katie, who became his wife in 1933. 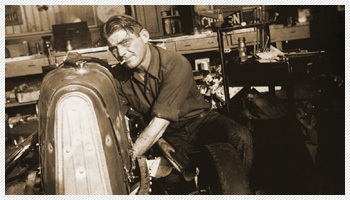 With his new brother-in-law, Vic opened his first repair shop on Wilshire Boulevard in Beverly Hills. The business flourished and in 1934 he moved into his own shop on the corner of Venice and Hoover in Los Angeles. Bobby Meeks, who retired in 1993, started with Vic at this time and became his loyal assistant. Between 1934 and the start of the war, several important events occurred. Vic Sr.'s reputation as an expert mechanic helped his business grow and he moved his shop three times during this period. Vic and Katie's only child, Vic Jr., was born in 1936. In 1938, Vic Sr. bought his first project car... a 1932 Ford Roadster. This car was a turning point in Edelbrock history. It was Vic Sr.'s entry into the world of "hot rods" and it inspired the design and manufacture of the first Edelbrock intake manifold. 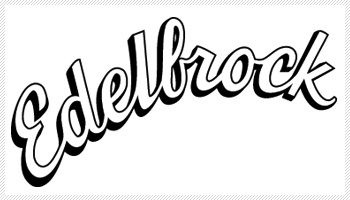 Vic Edelbrock Sr. was born in a small farming community near Wichita, Kansas in 1913. His father supported the family comfortably as the owner of the local grocery store. When the Edelbrock grocery store burned down in 1927, Vic left school at age 14 to help support the family. He had a natural talent for mechanics. His first job was at an auto repair shop where he developed his skills as an auto mechanic. When the Great Depression hit Kansas, the young Vic Edelbrock looked to the prosperous west for a new home.